My first home computer consisted of a small TV, a Texas Instrument keyboard, and a cassette player. The program was on the cassette tape. The concept of memory was nil. But it was fun and I upgraded with the multitude of changes that came along. There was a rumor about internet where some government folks were linked somehow via their computers. The idea of such possibilities at the time was baffling. Step by step, day by day, something in our lives keeps changing. I thought I’d reached my internet possibilities when I created a website for my artwork. Of course, that’s small thinking. I should know by now that there is always something more. And now, it’s “The Blog.” So, welcome to my online art journal. 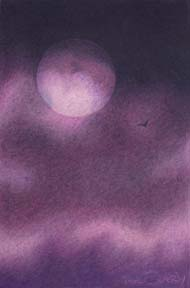 The artwork that I’ve decided to give honors to for this opening day is a 6 x 4″ colored pencil piece called “Moody Night.” This little gem is my contribution to a display built by the members of the Colored Pencil Society of America Detroit Chapter 104. It’s short life will exist at the CPSA convention this year in Bethesda, MD from July 31 through August 4, 2007. Unfortunately, I can’t make it to the convention this year, maybe next. Welcome aboard. Have a grand day!